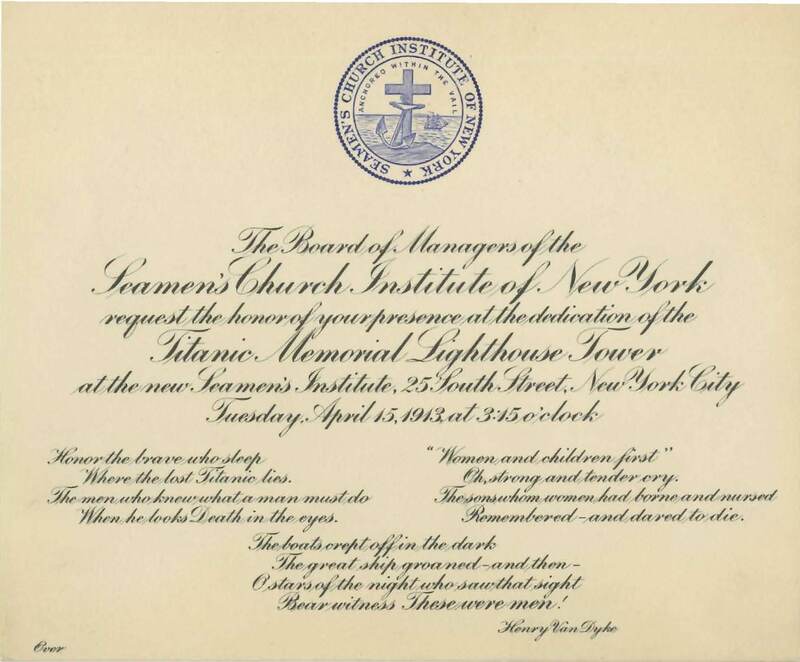 April 16, 1912 was supposed to have been a joyous day for Seamen’s Church Institute. That evening, they were scheduled to celebrate laying the cornerstone of their new building at 25 South Street. Earlier that day, however, news arrived of the sinking of Titanic, and excitement over the new building was overshadowed by a nation mourning the loss of over 1,500 people. The group in attendance at the ceremony made a plan to build a lighthouse on top of the building to commemorate the heroism displayed by many in the tragedy, as well as remember those who lost their lives. New York Herald, 1912. 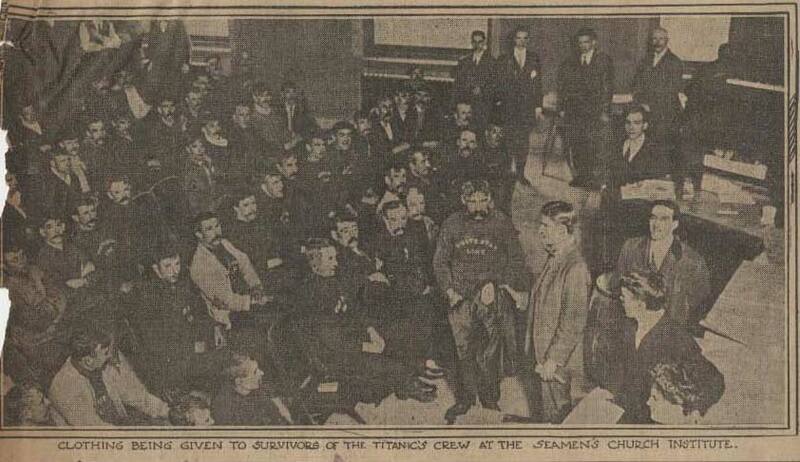 Surviving Crew Receives Clothing, 1912. Courtesy of The Seamen's Church Institute Archives. Building this lighthouse turned into a nationwide effort as people banded together in solidarity after the tragedy; it seemed that everyone donated to the cause. Wealthy socialites like Mrs. Cornelius Vanderbilt wrote checks and schoolchildren donated pennies and nickels . One year to the day after the sinking, the lighthouse was dedicated in front of a crowd of over 300. Although it served as a memorial, the lighthouse had a practical use as well. Designed by Warren & Wetmore (the architects of Grand Central Station), its signature green light (the only lighthouse in the country to use that color) could be seen by vessels 10 miles out in the Narrows, helping guide ships into port. A time ball was dropped every day at 12 noon, which ships in the harbor, as well as local residents and workers in Lower Manhattan, could use to set their watches. Samuel H. Gottscho (1875-1971). New York City Views. Detail of the Titanic Memorial on Seamen’s Church Institute, 1932. 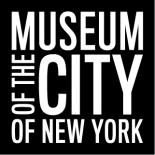 Museum of the City of New York, 88.1.1.2369. In 1967, Seamen’s Church Institute moved to new headquarters at 15 State Street and their original building, along with the lighthouse, was set to be demolished. 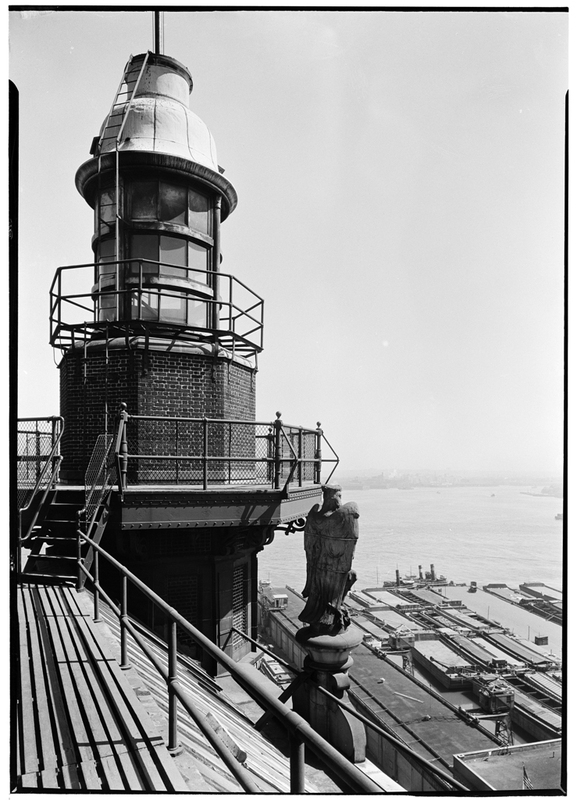 A group of concerned preservationists led by Frederick Fried, Friends of South Street Seaport, and the South Street Seaport Museum, banded together to persuade the demolition company to donate the lighthouse to the Museum. It now anchors a small park at the intersection of Fulton St. and Water St., at the entrance of the Historic Seaport District. Not only does it serve as a reminder of Titanic’s tragic story, it also documents the role of an important institution in the port’s history, provides a visible welcome to the Seaport, and reminds us of the need to preserve landmarks and artifacts. For more information about Seamen’s Church Institute and their work helping the surviving crew from Titanic, check out the SCI Archive’s digital exhibition. If you’d like to learn more about Titanic or to see the lighthouse in person, visit the South Street Seaport Museum, where today, April 10, 2012, the one hundredth anniversary of RMS Titanic’s launch on her maiden – and only – voyage, the Museum opens Titanic at 100: Myth and Memory, an exhibition that examines both the disaster and a century’s worth of fascination with the ship’s dramatic story. Loved this blog post. I had no idea about the history of this particular lighthouse. Enjoyed the pictures too! Shaun, thanks for your comment, and sorry for any confusion. Allow me to introduce myself. My name is MaryElizabeth Nora, and I’m the collections manager at the South Street Seaport Museum. To clarify, there are no intentions to demolish the lighthouse – quite the contrary! Many years ago, the South Street Seaport Museum and some local citizens worked together to save the lighthouse from destruction. It is now part of the Seaport Museum’s collection so that it will remain in Lower Manhattan as a monument to everyone on board Titanic. Thanks again for your concern, and we hope to see you at the Seaport soon. This entry was posted on April 10, 2012 by Anne DiFabio in South Street Seaport Museum and tagged Historical Preservation, Seamen's Church Institite, South Street Seaport, Titanic, Titanic Memorial Lighthouse.